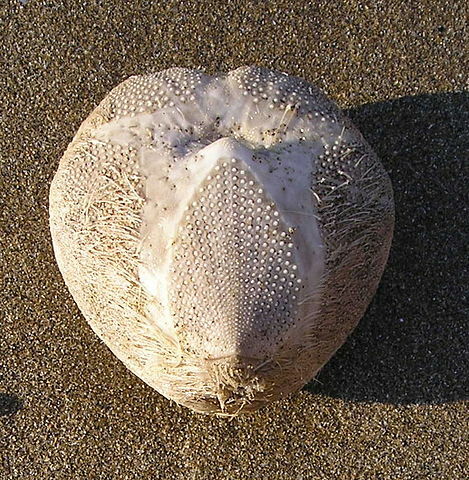 The sea potato is a heart-shaped urchin clothed in a dense mat of furrowed yellowish spines which grow from tubercles and mostly point backwards.Upper surface is flattened and there is an indentation near the front. This urchin is a fawn color but the tests that are found on the strandline have often lost their spines and are white. During life, the spines trap air which helps prevent asphyxiation for the buried urchin The ambulacrum forms a broad furrow in a star shape extending down the sides of the test. There are two series each of two rows of tube feet. The test reaches from six to nine centimeters in length.